Digital code to unlock the Final Fantasy XII official soundtrack background music option in-game. The Limited Edition is also available for pre-order at select retailers for $49.99. It will include the game, an exclusive steelbook featuring artwork by renowned illustrator Akihiko Yoshida (Final Fantasy Tactics, Final Fantasy XIV, NieR: Automata™), and a digital code to Final Fantasy XII official soundtrack background music option in-game. The first print run of the Standard Edition will also include a limited reversible coversheet featuring artwork by Akihiko Yoshida. Fans who pre-order the game digitally from the PlayStation Store will receive a static PlayStation 4 system theme (instant reward upon purchase), and four music tracks by Hitoshi Sakimoto (to be unlocked upon released). Finally, Square Enix announced that Balthier from Final Fantasy XII will be available as a downloadable champion summon in World of Final Fantasy starting March 23. 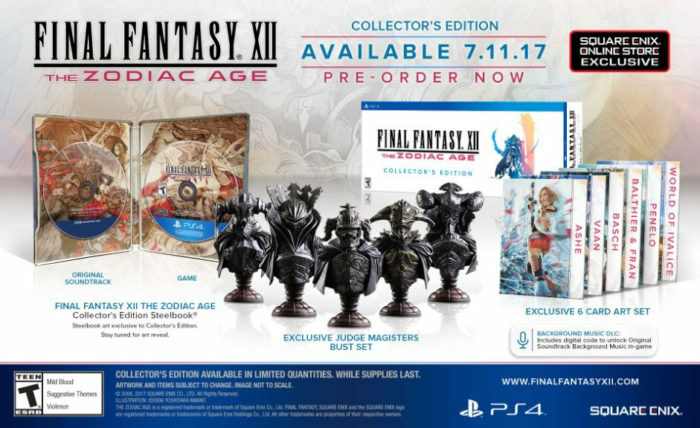 Fans can soon return to the world of Ivalice, as SQUARE ENIX® revealed the Final Fantasy XII The Zodiac Age Collector’s Edition, Limited Edition and Digital Edition, releases on July 11 for the PlayStation 4.